art of the pie. | joie de vivre! This crust is delicious too! Wow! One reader, Andy, suggested that I try a recipe from “Art of the Pie.” Kate McDermott runs a class here in Seattle, offering her expert pie-baking tips. I’ve read about her in magazines, both national and local, and her charming and loving approach to pie makes me feel more like an artist or creator than a baker tied to measurements. Her instructions are conversational and very warm, and she enlists you to trust your instincts as you create your pie. First, Kate offers tips about how to create the perfect lattice top, which I found helpful. This is so much simpler than how I was doing it! And now for the crust! Using cold hands, rub butter into flour. She recommends cutting the butter up into small chunks, but I loved Gavin’s suggestion of freezing the butter, grating it, and mixing it in with a spatula, so I chose to do that. Slowly add water. Swish around and don’t touch too much; warm hands warm up cold butter. Try to get it so it forms a nice all of dough; add more water until you get that. Divide into two discs, and let chill in the fridge for about an hour. Roll out using a little extra flour, until it’s about an inch bigger around than the pan you’re using. Once it’s assembled, brush the top with an egg white wash and sprinkle with a little sugar. After adding grated butter to flour, slowly mix in a few tablespoons of ice cold water until the dough combines more or less. Air on the side of using less water. Mini-pie! I lined the cast iron with parchment paper. This is what I listened to. It sounds like Americana, just like a slice of apple and berry pie. And the verdict…? Later this week after I try Christian’s mom’s recipe. 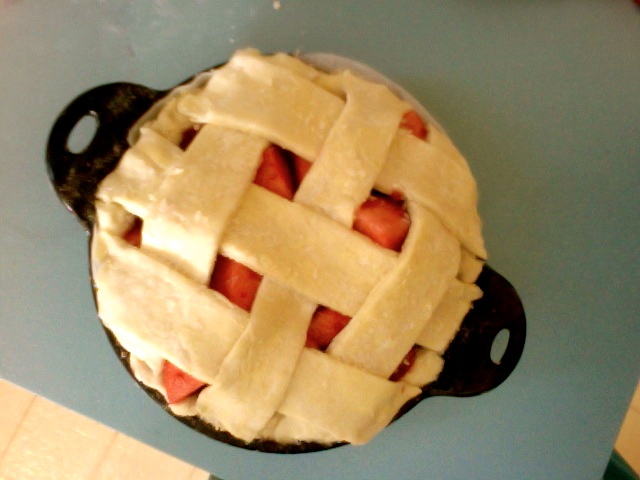 I am so into these pie posts! I feel like dough-based treats are the last frontier of baking for me, after spending many years trying everything else. Time to test out these crust recipes! Thanks, Amanda! I find this recipe to be the simplest, and it renders a delicious and beautiful crust! I’ve learned those are the most important! Look out for one more recipe tomorrow… and let me know how your foray into pie-baking goes! I actually don’t think grating butter works very well (at least for pie crust; i think it is good for things like scones) because it makes the fat parts too uniform, and also the small pieces (even when frozen) tend to melt too quickly. Having differently shaped fats for different flakiness gives a more interesting and varied texture. Butter isn’t as pliable as shortening/lard, so maybe cut butter into different sized pieces… (with shortening/lard, you can usually just pinch out different sized pieces). I’ll try cutting up butter this time. What you said makes a lot of sense, especially now that I know that cold ingredients are key. And that’s interesting about the vodka crust… I may give this a try, but we’ll see. I may be done with pie baking for a while after this week! One last thing… Have you tried crisco? And what were the results? It kind of grosses me out, but I hear it achieves a very flaky crust (see the most recent post). Hardly a master, merely an enthusiast. (though pizza pies, I will accept the honorific!). I have tried Crisco, or whatever the whole foods equivalent is; I just traded the lard bit for crisco (i’d run out of lard), so it was half-crisco half-butter. I’m not sure how Kate’s recipe with crisco tasted, though, because I gave it as a gift to my friends over at volunteer park cafe who never charge me anything for food, and they thought it was great. (and they’re better bakers than I; so either it was good, or they’re being nice). I can’t imagine a whole-crisco crust would be flavorful enough. My sis-in-law took her class just a few weeks ago! We’ve been spoiled silly round here with pie, even gluten-free pies! Ooh, fantastic! I’d love the gluten-free recipe, if you don’t mind passing it along, as I definitely have some friends who have a wheat allergy. Thanks!! We’ve used some mixes, with varying results. The best was Pamela’s, but I’d like to make my own mix of gf flours. For pie crust, I would use tapioca flour and brown rice flour with a bit of xantham gum as a binder. Hi there! So glad to see folks who have taken my workshop checking in recommending the recipe. If you do use all butter, cut it down from 16T to 13-14T. Be Happy, Make Pie! One other thought. You might want to revise your amount of water. 3T would mean to me a crust with too much fat or fats that are too warmed up, in other words not chilled enough. Pingback: on pie contests and going on 75-years-old. « joie de vivre! that mini-pie is the cutest thing i’ve ever seen & congrats on your victory, so awesome!! you are gifted.